Samajwadi Party (SP) chief Mulayam Singh Yadav and Rashtriya Janata Dal (RJD) chief Lalu Prasad Yadav broke bread with Lok Janshakti Party leader Ram Vilas Paswan at his residence 12, Janpath today. The Bombay High Court today refused permission to a city couple to abort their 25-week-old foetus, which was diagnosed with congenital cardiac disorder. Away from the cut and thrust of politics, Prime Minister Manmohan Singh will spend some quiet moments with his family and friends tomorrow. Back from the SAARC summit, the low-key launch of daughter Upinder Singh’s new book might just be the moment Manmohan Singh, the father, would be looking forward to. Leading global aircraft manufacturers today submitted proposals to the government that offered partnership to develop capacity for the aerospace industry, more investment, that could run into billions of dollars, and opportunities to develop export potential. Japan, a key member of the nuclear suppliers’ group (NSG), is likely to support India’s case for a clean exemption for undertaking nuclear trade at the NSG meeting on August 21-22. Acute shortage of manpower has resulted in the Bureau of Civil Aviation Security (BCAS) being reduced to a body merely issuing regulations without having adequate capacity to oversee adherence to such regulations by the agencies concerned. The Supreme Court today threatened arrest warrants against Tamil Nadu Chief Minister M. Karunanidhi and union minister T. R. Baalu on the Sethusamudram bandh row, terming their belated compliance of its directive as “detestable”. After the recovery of 28 live bombs since the July 26 serial bomb blasts in Ahmedabad, the diamond city continued to be in the grip of fear after the superintendent of the civil hospital here received a letter today, saying a bomb was planted on the premises. India is headed for an e-waste crisis with majority of global electronic brands having no functioning e-waste take-back facility in the country. This despite many of these brands providing a voluntary take-back facility in other countries, says a Greenpeace study released today. “State quarrying has been a bane for Himachal Pradesh,” the sixth state of India’s environment report, prepared by the Delhi-based Centre for Science and Environment (CSE), has said. With the Lok Sabha elections around the corner, both the ruling Bharatiya Janata Party (BJP) and the opposition party Congress in Uttarakhand are serious about fighting the panchayat elections scheduled to be held in the state on August 5, 7 and 10. Deficient rainfall has affected water storage levels in some of the country’s important reservoirs. The Central Water Commission data on storage position of 81 important reservoirs released today disclosed that the present storage was 58 per cent of the last year’s storage. Maj-Gen K.V.S. Lalotra, additional director general (ADG), Territorial Army, visited 106 Infantry Battalion (Territorial) Army PARA in Bangalore today. This is his first visit to Bangalore after assuming the post of additional director general of Territorial Army, New Delhi. His name is Mahesh Bhatt and he too is a film-maker. Within a short span of two years, this young filmmaker from Garhwal has made a name for himself. He has made films with the aim of spreading awareness about important social and environmental issues. Communist Party of India (Marxist) general secretary Prakash Karat today held the UPA Government responsible for the “deteriorating” law and order situation in the country and alleged that the recent bomb blasts in Bangaluru and Ahmedabad pointed to total failure of the national security management. The Gauhati High Court has pulled up the regional passport office here for being callous in its way of functioning after it has found how a ‘Bangladeshi migrant’ managed to get hold of an Indian passport. Security has been beefed up in Hardwar district of Uttarakhand following another letter threatening to blow up railway stations and other vital installations here and across the state on Independence Day. Bihar Chief Minister Nitish Kumar today alleged that execution of various railway projects in the state during the regime of Lalu Prasad moved at a snail’s pace. The ministry of power convened a meeting of all ministers under the chairmanship of Union minister of power Sushilkumar Shinde facilitate expeditious decision on development of the five more Ultra Mega Power Projects (UMPPs) in the states of Chhattisgarh, Karnataka, Maharashtra, Orissa and Tamil Nadu. Accusing the ruling BJP of trying to influence the election for cooperative bodies in Uttarakhand, the Congress today said the state BJP government was resorting to undemocratic means to ensure a success in the cooperative polls, which are underway in the state. Union minister of state for rural development Chandra Sekhar Sahu said today that the country was facing an acute shortage of professionals in rural development management for effective and efficient delivery of rural development programmes and services. A juvenile court here has sent Rituraj Singh Dikhit, who was arrested yesterday in connection with the murder of two children at the Sant Asaram Gurukul Ashram in Chhindwara, in judicial custody till August 13. Aside of the duly appointed parliamentary panel, the cash-for-votes controversy has suddenly attracted other investigators. This they did at a time when the Lok Sabha panel, headed by senior Congressman V. Kishore Chandra Deo, was holding a parallel and authorised meeting to get to the bottom of the truth. The panel today viewed the seven CDs earlier submitted to the Lok Sabha Speaker by petitioning BJP MPs Ashok Argal, Mahavir Bhagora and Fagan Singh Kulste. They took three hours to monitor the evidence available and later directed the Lok Sabha secretariat to prepare transcripts of CDs to enable progress in the probe. “We will now meet on August 7 to hear the petitioners and the representative of the channel that conducted the sting operation in question,” Deo later told The Tribune. He exercised restraint when asked if political parties should make public the so-called new evidence when the parliamentary panel was seized of the issue. For the panel, the prime consideration is completion of the probe in time. Indications, however, are that it will seek more time to complete the probe. The current deadline is August 11, but Deo and panel members, including Mohd Salim of the CPM, said more time would be needed. “Since we are committed to reach the bottom of the truth howsoever ugly it is, time should not be a consideration. We will approach the Speaker for grant of extension to the panel,” Salim said. With regard to the content and quality of CDs, the panel remained silent, saying it will mention the relevant observations in its report. As of now, the panel feels that it has enough expertise to determine the veracity of the evidence on board. “We have in the past successfully decided matters involving the conduct of MPs, and have even had members expelled from the House. We do have expertise available. If necessary, we can seek outside help,” Salim said. As for power of the panel to ensure action - it can recommend expulsion of a member if found guilty. It also has the power to recommend imprisonment in 40 days from the last day of the session. Meanwhile, chairperson Deo admitted that the panel had received two additional CDs in the case. One of these is from SP’s Amar Singh, who along with Reoti Raman Singh and Congress’ Ahmad Patel, faces the charge of bribing three BJP MPs. The other is from the expelled BJP leader Uma Bharti, who earlier embarrassed the BJP, saying its own hands were mired in dirt. These CDs are yet to be viewed by the panel, which will summon Reoti Raman Singh, a Lok Sabha member, at a later stage. Regarding summoning Amar Singh and Patel, both Rajya Sabha members, Deo maintained his earlier stand. Permission of the presiding officer of Rajya Sabha would have to be sought to summon RS members. That’s not possible until leave of the House is sought. And leave can only be sought when the House is in session. As of today, the monsoon session is nowhere near its August 11 schedule. 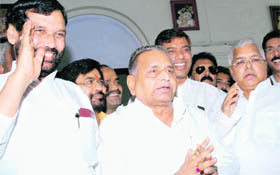 Samajwadi Party (SP) chief Mulayam Singh Yadav and Rashtriya Janata Dal (RJD) chief Lalu Prasad Yadav broke bread with Lok Janshakti Party leader Ram Vilas Paswan at his residence 12, Janpath today. These three leaders were veterans of the undivided Janata Dal and champions of the Mandal movement and they came together here today after nearly 20 years. The occasion was pretty mundane and puerile, to lend credibility and respectability to SP general secretary Amar Singh’s counter sting CD against the BJP, trying to prove that the BJP had manufactured the “cash for votes” sting CD. But beyond that this meeting carried a more significant political message that the rise of Mayawati on the national political horizon with the backing of the Left and other non-Congress, non-BJP parties has caused some unease among these veterans of backward, Dalit politics. There were only two important figures of the Mandal days missing today. That is JD-U president Sharad Yadav and Bihar Chief Minister Nitish Kumar, who are now aligned with the BJP. These five leaders had played an active role first in the creation of Janata Dal under V.P. Singh and then in the formation of the Janata Dal-led government in 1989. When V.P. Singh announced the implementation of the Mandal Commission report in August 1990, Sharad and Paswan were his two permanent advisers and comrades at arm. Mulayam and Lalu were ruling Uttar Pradesh and Bihar, respectively, and while Mulayam eventually broke away from the Janata Dal to join hands with Chandra Shekhar splitting the Janata Dal, he was equally enthusiastic about the rise of OBCs in north Indian politics. 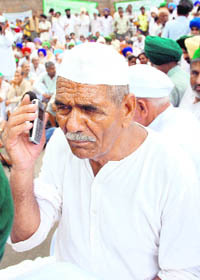 Lalu Prasad the other Mandal neta, originally in the Devi Lal camp, stuck by the Janata Dal. With Mulayam out by 1996, the Janata Dal had shrunk to Bihar and somewhat in Orissa. It performed well in Karnataka under H.D. Deve Gowda and thus succeeded in leading the United Front government in 1996. But before that government fell, Lalu branched out on his own floating the RJD and by 1999 Paswan too had floated his Lok Janshakti Party (LJP). In the intervening period, there were many occasions when Paswan came together with Lalu or Mulayam and Lalu formed a joint front, but these did not last too long. Even then Paswan and Lalu shared a love-hate relationship because of their common political turf in Bihar and so had Lalu and Mulayam, both being Yadav leaders. But today Lalu needs Paswan to consolidate his vote bank against Nitish in Bihar and is willing to concede many more seats this time to Paswan than he gave in 2004 general elections. He also needs to ensure that Mulayam does not cut into his Yadav vote base in his home state. Similarly, Mulayam having jettisoned the Left needs Lalu and Paswan to reinforce his secular credentials and the unchallenged leadership of Muslims and Yadavs in Uttar Pradesh. Bench of the court asked the couple to seek help from the legislature. “It is the job of the legislature to help you alter the provision. We cannot legislate the provision,” the judges observed. The petitioners Niketa and Haresh Mehta had moved the court seeking abortion of the foetus after their unborn child was diagnosed with a severe heart disease, which would make it necessary for the baby to wear a permanent pacemaker. An expert committee of doctors headed by the dean of the J.J. Hospital, appointed by the court to examine the case had said the foetus had “a fair chance” of having a congenital handicap at birth. But the committee also seemingly contradicted itself stating that “the findings observed do not have substantive significance to resort to termination of pregnancy”. The parents in their petition said medical opinion obtained by them held that the child would need a pacemaker to be installed immediately after its birth and would need to be replaced every five years. Apart from forcing the child to live a poor quality of life, it would result in huge medical expenses of the parents, the petitioners held. The couple also said they were planning to have another child with the hope that it would turn out to be healthy. Challenging the old laws governing abortion, Nikhil Datar, doctor of the couple, said the laws dated back to the time when there were no superspeciality hospitals. He told reporters that it would not be possible for experts to determine congenital defects in an unborn foetus before it was 24 weeks old. The Mehta’s case has hit the headlines with NGOs, social organizations and women’s rights groups taking up the issue. The Catholic Church joined the issue last weekend with Mumbai’s Bishop Agnelo Gracias appealing to the couple not to abort the foetus. He said the Missionaries of Charity run by Mother Teresa’s nuns were willing to raise the baby. No surprise then that he has blocked time tomorrow evening to join his wife and the rest of the family in celebrating his historian daughter’s academic accomplishment. That this one is big is evident from the 500-strong guest list the publishers - Pearsons -- have drawn up. A look at the list and you know how very much the organisers want tomorrow’s affair to be one between the family and friends. There is no politician or minister in the guest list, though there are some bureaucrats and ambassadors of countries that might be interested in Upinder’s work titled “A History of Ancient and Early Medieval India: From the Stone Age to the 12th Century”. The 704-page book, priced at Rs 3,500, is currently being brought out as library edition. The student edition is on the cards as the work primarily targets graduate and postgraduate students. The publishers describe the book as a landmark in the history of Indian publication. “A lot of scientific pedagogy has been built into the work. It has 47 original maps, 60 illustrations; it is big sized and full of colour. Most of all, it allows general readers to form opinion,” Debjani M. Dutta, senior managing editor with the publishing house, today told The Tribune. She admitted that the guest list had been deliberately kept apolitical to ensure that the focus remained where it was meant to remain. Among those expected to attend the event at Taj Mansingh tomorrow are ambassadors of Pakistan and France and the German cultural attache. While the latter two might be interested in translations of the work, Pakistan’s presence was ensured to put academic discussions on the book in perspective. There will also be directors of all major academic research institutes like the Indian Historical Research Institute, VCs of some universities and many of Prime Minister’s and his daughter’s personal friends. For the PM’s family, eight seats have been reserved. Among these will be PM’s Delhi-based daughter Daman and her family. In essence then, everyone invited for the function has something do with Upinder’s book, either in terms of working on it or in terms of being interested in it. Also, the organisers are not calling the event a book release function.“It’s a low-profile event where the author will introduce the work and talk about it. We have just two more speakers,” Dutta said. These include Upinder’s friend and colleague Nayanjot Lahiri, who teaches ancient Indian history at Delhi University, and Aditya Arya, whose photographs have been generously used in the book. The companies have offered to open their technologies to India as they have to meet their obligations of involving the Indian industry as it is clause for the supply of the 126 medium multi role combat aircraft (MMRCA). The proposals were submitted by the bidding companies. Under the defence procurement procedure, all foreign companies bidding for major Indian defence contracts worth more than Rs 300 crore have to invest 30 to 50 per cent of the order in Indian defence sector. This is seen as a decision that will benefit the Indian companies in the long run. The Russian MiG has submitted the investment proposals. American aviation and defence companies like Lockheed Martin, Boeing, European company EADS, French Dassault and the Swedish Gripen. American Boeing has said that it will develop a global competitiveness and growth through a partnership with Indian industries. Similarly, the Lockheed martin, which is bidding with their F-16 for the Indian MMRCA contract have proposed more investment manufacturing for export and joint development of defence systems. Through the new defence procurement procedure, which was made public only last week, permitted foreign companies to allow more time to Indian companies to develop capacities. The MMRCA bid was made earlier that this date hence it will not be covered under this clause. They have to develop the capacities upfront. Chris Chadwick, president of the Boeing military aircraft, said to meet India’s requirements, the company had assembled an industrial line-up of Indian companies and US. Earlier this year, Boeing had reached an agreement to form a joint venture with the TATA industries, as well as signed a memorandum of understanding with the Hindustan Aeronautics Limited and also the Larsen and the Toubro. The Lockheed Martin provides India the opportunity to develop advanced defence technologies, manufacturing capabilities and defence systems. This would help to develop aerospace and defence technologies. This indication was given by a Japanese foreign ministry spokesman, ahead of the talks between his foreign minister Masahiko Koumura and external affairs minister Pranab Mukherjee tomorrow. In an informal interaction with the media here, the spokesman said Tokyo wants to “actively participate” in the civil nuclear programme with India, emphasising that his country understands New Delhi’s growing energy needs. The spokesperson further underlined his country’s desire to cooperate with India in this field in a manner that will not “hamper but strengthen” the international disarmament and non-proliferation regime. “Japan intends to actively participate in the civil nuclear programme from a broader and comprehensive perspective and in a manner not to hamper, but to strengthen the international disarmament and non-proliferation regime,” the spokesperson said. Japan was part of the international consensus in the 35-member board of governors of the IAEA on Friday, when the India-specific safeguards agreement with the agency was unanimously approved in Vienna. India would need Tokyo’s support yet again when the NSG meets to discuss an exemption in its guidelines that will allow nuclear commerce between its members and New Delhi. Observing this, a parliamentary committee has revealed the sanctioned strength of critical positions in the BCAS remained unrevised since its formation in 1987, despite tremendous expansion in its responsibilities with the growth in the civil aviation sector. The committee, in its report released about three months ago, stated that it was “appalled” at the callous treatment meted out to this important institution. BCAS is the regulator and overall supervisor of aviation security in the country. “Worse, the actual strength of the staff attached to the assistant commissioner of security and the deputy commissioner of security in the BCAS did not even meet 50 per cent of the sanctioned strength till May 2007,” the report stated. Calling for urgent steps to expedite the plans to restructure and strengthen the BCAS on priority, the committee recommended that besides the regulatory functions of the BCAS, its supervisory and inspectorial functions and responsibilities should be enhanced to cope up with the aviation security challenges posed by unprecedented growth in the domestic civil aviation sector as also the entry of the private airport and airline operators. Further observing that the airport director holds a critical responsibility of overall management and coordination of security matters in the airports, the panel has recommended that the airport director be relieved of this responsibility so that he can devote more attention to safety management. In view of the trend of privatisation of airports, the committee was of the opinion that in the interest of national security, it may not be advisable that an airport director of a private airport be entrusted with vast security related responsibilities. Recommending that an officer from the BCAS should be put in charge of security at each airport, the committee has suggested that the airport director should be made accountable to the security chief at the airport in all matters of security. “You are not above everything. The Chief Minister is not above the law,” a Bench of Justices B.N. Aggrawal and G.S. Singhvi, observed while slamming the Tamil Nadu government for its attitude on the contempt petition relating to the state-sponsored bandh on the Sethusamudram project on October 1, 2007. The judges took strong exception to the Chief Minister and the union minister delaying their replies to the contempt notices issued to them. The hospital authorities called the police and for around four hours, police officials, including the bomb disposal squad, searched the entire hospital but no bomb was found. The study - “Take-back blues: An assessment of e-waste take-back in India” - reveals that some companies are part of possible solution for this problem, adding that even in the absence of a guiding legislation, Indian brands like HCL and WIPRO are offering pan-Indian voluntary take-back and recycling service to customers. The study presents the position of each brand on Individual Producer Responsibility (IPR) and its application on the ground through the take-back services offered in India. The document focuses only on policies and practices of electronic brands on Indian market and findings are not applicable to other countries. Greenpeace examined the policy-and-practice on e-waste take-back offered by 20 e-brands in India. However, only one global brand (Acer) and two Indian brands, HCL and Wipro, have functioning take-back services in India, the environmental organisation claims. “On the other hand, big brands like Nokia, LG Electronics and Motorola are still not able to make their take-back service in India fully operational. Market leader HP, along with other PC makers Dell and Lenovo, is involved in green-wash, as their take-back service is completely non-existent on ground. With the exception of two brands, Acer and HCL, no brand has come out publicly on the issue of supporting e-waste legislation in India,” Pratap says. Legislation embracing producer responsibility for e-waste is in force in the EU, Japan, Korea, Taiwan and some US states. In 2007, India generated 1040 tonnes of e-waste every day from discarded computers, televisions and mobile phones. This is projected to more than double by 2012 to 8,00,000 per annum with a growth rate of 15 per cent. At present, merely three per cent of the e-waste reaches authorised recyclers while remaining lands in informal recycling yard, causing threat to environment and public health. The Greenpeace has demanded that brands having no policy for take-back in India should immediately announce such service. “Brands whose take-back service is not working on the ground need to tighten the noose. These measures need to be backed by policy based on the IPR that provides for the entire lifecycles of a product,” it adds. The report was released here today in the presence of CSE director Sunita Narain, associate director Chandra Bhushan, chairperson of Karnataka State Pollution Control Board H.C. Sharatchandra and others. The report says the Dhauladhar range has been shorn of its green cover because of state quarrying. “Mining at the Khaniara state quarries in Kangra district has stripped up to 60 per cent of the forest cover and caused innumerable landslides”. According to the CSE, state mining has also aggravated the problem of soil erosion. Surface run-offs have increased, and flash floods have become frequent in the region. The waters of the Manjhi and Manooni khuds in Kangra have turned grey with slate particles and debris from mines. The report says quarrying in the state is being carried out in violation of a host of laws such as the Forest Conservation Act, the Explosives Act and the Mines Safety Act. Workers of these mines work under unsafe conditions and the actual area under mining often exceeds the original area sanctioned for mining. The report, while expressing concern about rampant extraction of limestone in Himachal Pradesh, says Solan has the maximum area under mine leases in (Sirmaur) has the maximum number of leases). The report flays the Himachal government for laying the “red carpet” for cement manufacturers, aggressively promoting the state in the name of development and employment generation. It laments that one company, Jaiprakash Associates, has undertaken a Greenfield project for manufacturing three MT of cement in Bhaga Balag in Solan, while another two-MT cement plant is slated to come up in the Choupal region. While the Congress claimed that the panchayat elections would be a referendum of the BJP rule in the state, ruling BJP claimed that the clean administration provided by the Chief Minister Maj-Gen. B.C. Khanduri (retd) would stand them in good stead. The BJP today released a list of 267 candidates for zila panchayat seats in 10 districts of the state. "The list of candidates of Dehra Dun and Chamoli districts would be released tomorrow," said Ajay Bhatt, general secretary of the Uttarakhand BJP. He claimed that the developmental work initiated by the Khanduri government would help the party sweep the panchayat polls. On the other hand, Uttarakhand Congress Chief Yashpal Arya and Leader of the Opposition in the state assembly Harak Singh Rawat, in a show of unity, jointly released the list of 243 candidates for nine districts. "We will repeat the fine performance of 2003 in the panchayat polls if the ruling BJP allowed free and fair elections," claimed Harak Singh Rawat. The Congress had won majority of the seats in the 2003 panchayat polls. Congress president Yashpal Arya said there was near consensus in the party on the issue of selection of party candidates. Interestingly, in the civic elections held in March this year, independent candidates topped the list of the winning candidates in the entire state. The CWC monitors storage position of 81 important reservoirs spread all over the country of which 36 reservoirs have significant hydro-power benefits with installed capacity of more than 60 mw each. The combined live storage in these 81 reservoirs at the beginning of monsoon on June 1 was 19 per cent of their designed capacity, increasing to 32 per cent on July 31. But the present storage is 58 per cent of the last year’s storage and 94 per cent of the past 10 years’ average storage during the same period. Out of these 81 reservoirs, there are at present 36 reservoirs where this year’s storage is 80 per cent or less than the average of previous 10 years. In the remaining 45 reservoirs, the storage is more than 80 per cent of the average of previous 10 years. CWC officials say in order to derive the best possible benefits from the available water, they are in touch with the department of agriculture and are providing information of the weekly storage position to the Crop Weather Watch Group for evolving suitable crop strategies and are also apprising various departments and ministries involved in water resources planning. The ADG met Sudhakar Rao, chief secretary of Karnataka, along with Col S.K. Thapa, commanding officer of 106 Infantry Battalion (TA) PARA and discussed the possibility of raising of a new ecological Territorial Army unit in Karnataka. The proposed unit will comprise ex-servicemen belonging to Karnataka and civilian volunteers. His name is Mahesh Bhatt and he too is a film-maker. Within a short span of two years, this young filmmaker from Garhwal has made a name for himself. He has made films with the aim of spreading awareness about important social and environmental issues. Two short entertainment films with a message that he directed have been well received by masses in the hills. It was Piyush Rautela, Director of the Disaster Mitigation and Management Centre, Uttarakhand, who hired Bhatt, to make film on the dangers of an earthquake and give the all-important message on the need to build earthquake-resistant houses in the hills. Uttarakhand falls under the seismically most sensitive zone four and five. Bhatt could have made a documentary that did not appeal to the masses, but Rautela and he decided to make an entertaining film with the works-songs, dance, romance, emotions and suspense. However, stealthily the film also conveys a message. So, “Dandi Kanthi Ki Goad Maa”, a Garhwal-Kumoani film was made with a proper storyline. The hero of the film, a skiing instructor with dreams of becoming a world class instructor, wants to give all creature comforts to his widowed old mother living in the hills. With a sprinkling of romance, the four Garhwali songs sung by prominent Garhwali singers- Kishan Mahipal, Deepa, Sangeeta Daundiyal and Manu Vandana-have added a spark to the film. The hero builds a house for his mother but ignores earthquake-resistant techniques. An earthquake devastates his life: his mother is killed and her new house collapses. The hour-long film, made at a cost of Rs 4 lakh, was financed by the Disaster Mitigation and Management Centre (DMMC), Uttarakhand and the United Nations Development Programme (UNDP). It has been able to convey the message to the people in the hills. “We are taking the CDs of the film to remote villages in the state. I have seen people crying after seeing the film,” Bhatt told The Tribune. Another film, “Nanda Ki Paheli Jat” on the girl child and women’s empowerment has become a success. Bhatt is in the process of making another film on the problem of landslides in the hills. Addressing partymen at the 19th state conference of Tripura CPM, Karat asserted that international terrorist organisations were posing a major threat to the country due to the “inefficiency” of the Manmohan Singh Government. He said by moving ahead with the nuke deal to the International Atomic Energy Agency (IAEA), the Prime Minister had compelled the Left parties to withdraw support to the UPA Government. Karat stated that they withdrew support as “the Left can never compromise on such an important issue in which the involvement of American imperialism is so explicit”. He claimed that the BJP’s opposition to the deal was confined to only one aspect — that the country’s capability of producing nuclear weapons would be compromised — but the BJP had accepted the other condition of the deal and it was not opposed to the strategic agreement with the US. Appalled at the accumulation of uncollected garbage and random disposal of poly bags in and around Mussoorie, these budding officers have initiated a solid waste management campaign in the town in collaboration with the local and district administration. It all started in April when a group of trainees, under the leadership of Padamveer Singh, joint director of the academy, started collecting garbage scattered in and around the academy. According to Purushottam Kumar, secretary to the joint director: "the fact that officer trainees were personally engaged in garbage collection motivated residents and the administration of Mussoorie." Subsequently, other organisations in the town, including the Indo-Tibet Border Police (ITBP) and all convent schools, have also joined hands and till date more than 3,500 kg of plastic waste has been collected and sent for recycling. Solid waste management has been a major problem for the local authorities, particularly in the light of the fact that every year more than 2 million tourists visit Mussoorie. The probationers have also taken the onus to spread awareness among visiting tourists about waste disposal. In a case that has brought to the fore how illegal Bangladeshi infiltrators continue to live in Assam through forgery and manipulation by becoming voters and obtaining passports, the HC has directed the police to ensure immediate custody of a Bangladeshi national till he is deported to Bangladesh. The court order came after it heard the petition of a Bangladeshi national, Abdul Hasim who challenged in the HC the judgment dated August 23, 2007, passed by the Foreigners’ Tribunal, Hojai, in case (No. FT/H/6/2006), declaring him to be a foreigner. Besides, the Court found out that the petitioner made use of two separate school certificates, one for the tribunal and the other for the passport office, showing two different names - Md Abdul Hasim and Abdul Hasim Ali. The court also pulled up the RPO authorities saying that it was “unmindful of the aforesaid infirmity in the ration card vis-à-vis the application form, and that the petitioner could not produce the voters’ list of 1986. The passport authorities also did not verify as to whether it was the petitioner who had filled in and/or signed the application form, it added. “Due to the callous approach of police and passport authorities, the petitioner, a foreigner could obtain Indian passport, which is a solemn document to testify one’s Indian citizenship…This is how the sovereignty of India is being protected by the authorities.” the court said. The letter, allegedly written by an unidentified terrorist outfit, warned of several blasts at railway stations and religious places across the state on August 15. The letter was addressed to a Javalpur station master who reported it to the police yesterday. In the past two months, it was the fifth letter threatening blasts. A similar letter warning of blasts was received last month also. The last letter, allegedly written by the JeM militant outfit, was addressed to a Laskar station master and warned of a number of blasts in Uttarakhand and targeting prominent leaders like UP CM Mayawati. “Prasad did not even hesitate to present ‘distorting’ pictures to take credit of railways earning unprecedented profits during his tenure,” Kumar told newspersons here at Janta Durbar. “In distorting the facts, Prasad is like Gobbels who was the propaganda minister of German dictator - Hitler,” he said. “Prasad is himself responsible for the tardy pace of progress of railway projects in Bihar and his allegations against the state government in this regard is baseless and misleading,” the Chief Minister said. He brushed aside the allegations of Prasad that the state government was not co-operating in execution of railway projects in Bihar and clarified that the NDA government was serious in acquisition of land for the said projects. This move comes in the backdrop of substantial progress already having been achieved for four projects at Mundra, Sasan, Krishnapatnam and Tilaiya. All three-power projects awarded so far Mundra in Gujarat, Sasan in Madhya Pradesh and Krishnapatnam in Andhra Pradesh had now indicated substantial preponement of their commissioning schedules. It is expected that it would now be possible to commission a few units under the UMPP aggregating about 3,000 MW within the 11th Plan itself. The meeting was attended by finance minister, P. Chidambaram, minister of law and justice H.R. Bhardwaj, minister of science and technology and earth sciences Kapil Sibal, deputy chairman, planning commission, Montek Singh Ahluwalia, minister of state for power and commerce Jairam Ramesh. During the meeting, minister of energy, Tamil Nadu, confirmed a site at Cheyyur, along with a captive port at Paramankeni for development of a power project in Tamil Nadu. There was also a strong request for a second project at Cuddalore, for which site details would be sent shortly. The energy minister of Maharashtra confirmed the availability of Munge site in Sindhudurg district for setting up the project, along with a nearby captive port. The energy secretary of Orissa confirmed availability of water for the already identified site at Bedabahal in Sundergarh district. Though sites in Bijapur district were indicated in Karnataka by the power minister of Karnataka, it was felt that further studies would be required before taking a decision for locating a project in the suggested sites which are not coastal locations. Today’s meeting had resulted in final decisions being taken for the sites for setting up one project each in the states of Tamil Nadu, Maharashtra and Orissa. It was decided that immediate action would be taken by all concerned towards early implementation of these projects, so that the overall benefit of 12,000 MW from these three projects could be brought on stream at the earliest possible. Interacting with mediapersons, Congress MLA and head of party’s panel for cooperative polls Tilak Raj Behad said while autonomy for cooperatives was the buzzword in the country, the BJP government in Uttarakhand was resorting to undemocratic tactics to forcibly get the control over cooperatives in the state. He said the statement made by Uttarakhand cooperatives minister expressing government’s willingness to contribute its share in profit making cooperative banks at this juncture only reveals latter’s intention to influence the poll process. While pointing out that there has been sudden increase in number of applications at Dehra Dun and Haridwar offices of registrar of societies seeking registration as new cooperative societies, Congress leader Behad said this too was a ploy on part of the ruling BJP to further its cause in the cooperative elections.